STAFFORD SPRINGS, Conn. — When the final checkered flag of the 2016 season was unfurled at the NAPA Fall Final, it brought an end to a season that awarded Stafford drivers over $55,000 through the track’s Contingency Program Partners. Stafford’s premier SK Modified® division led the way in payments to drivers with over $23,000 in contingency payouts. The July 8 NAPA SK 5k was the biggest race of the season with over over $8,000 in contingency thanks to special contributions from Dunleavy’s Truck & Trailer Repair and Wheelers Auto along with the regular weekly SK Modified® contingency sponsors. Providing weekly contingency bonuses were Dunleavy’s Truck and Trailer Repair, Maybury Material Handling, Call Before You Dig, Casagrande Builders, and New England Racing Fuel, Sunoco Brand. Special contingencies were provided by NAPA Auto Parts, Magnus Transmissions, Stafford Speedway in Memory of Mario Fiore, T/A Engines, Xtra Mart Convenience Stores, and Speedway Services. 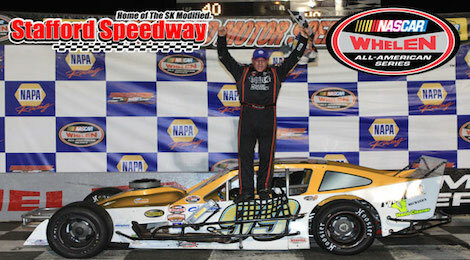 Stafford’s Late Model drivers took home over $6,000 from contingency payouts. Mr. Rooter Plumbing, 32 Signs, and New England Racing Fuel, Sunoco Brand were the contingency sponsors of Stafford’s top full fendered division with special contingencies provided by NAPA Auto Parts, Magnus Transmissions, Xtra Mart Convenience Stores, and Speedway Services. The SK Light division took home over $10,000 in contingency awards during the 2016 season. Weekly contingency was provided by Dunleavy’s Truck and Trailer Repair, Maybury Material Handling, On-Time Accounting, Olson Apartments, and New England Racing Fuel, Sunoco Brand. Special contingencies for the season included contributions from Xtra Mart Convenience Stores, R.A.D. Automachine, and Magnus Transmissions. Stafford’s Limited Late Model division took home over $5,000 in contingency bonuses from Mr. Rooter Plumbing, 32 Signs, and New England Racing Fuel, Sunoco Brand. Special contingencies were provided by Xtra Mart Convenience Stores, R.A.D. Automachine, and Magnus Transmissions. The DARE Stock division scored over $4,700 in contingency provided by Paradiso Insurance, Jeff Ramsey Carpentry, and New England Racing Fuel, Sunoco Brand. Special contingencies were provided by Xtra Mart Convenience Stores, R.A.D. Automachine, and Magnus Transmissions. The Rookie of the Year program at Stafford contributed $5,600 with NAPA Auto Parts contributing $1,000 each to the SK Modified® and Late Model rookies of the year. R.A.D. Automachine provided $500 each to the SK Light, Ltd. Late Model, and DARE Stock rookie winners with T/A Engines giving a $500 bonus to the SK Modified® rookie. Magnus Racing Products contributed a total of $1,600 to Stafford rookie runner-ups with $400 to the SK Modified® and Late Model division, $300 to the SK Light and Ltd. Late Model division, and $200 to the DARE Stock division. In addition to their weekly contingency bonus for the SK Modified® division, Call Before You Dig also provided a total bonus of $4,055 that was paid out through the CBYD 811 Challenge that paid 5 drivers an $811 bonus through a unique points system based on drivers finishes in feature events. The five drivers who came closest to scoring 811 points without going over through the August 5th feature event each won $811. Another special program was the Xtra Mart Xtra D program that gave extra money to the top-5 finishers in an extra distance feature for each of Stafford’s five NWAAS divisions. Xtra Mart contributed a total of $3,750 spread among the SK Modified®, Late Model, SK Light, Ltd. Late Model, and DARE Stock divisions during the season through its Xtra D program. For more information on how to become a partner of the Stafford Speedway Contingency Program, contact the Stafford Motor Speedway track office at 860-684-2783 or visit us on the web at www.staffordspeedway.com.